Lake Superior and its tributaries offer outstanding fishing in Ontonagon County. Salmon, lake trout and whitefish provide exciting action for anglers. Inland lakes offer fishing for perch, walleye, smallmouth bass and northern pike. And throughout the area, countless woodland streams offer great fishing for native brook trout. A fishing license is required and can be purchased at the Porcupine Mountains Wilderness State Park Visitor Center. Lake Superior is one of America’s greatest fishing resources. Deep, cold and pure, the waters hold a variety of trout and salmon species, including steelhead, lake trout, brown trout, Chinook salmon and coho salmon. In spring and fall, anglers can find success fishing for lake trout and salmon from the shoreline at Union Bay. In the spring, smelt can be found in several streams that enter Lake Superior. Charter fishing opportunities are available on Lake Superior. Superior Charters, JJ’s Tackle Shack and Voyager Charters are based out of Ontonagon, and Nomad Charters offers fishing trips out of nearby Black River Harbor. All charters are available by reservation only. Please plan your excursion in advance as charters fill up quickly. Lake of the Clouds is known for its bass fishing. The lake is catch-and-release only and there are no boat rentals on site. Light watercraft can be carried in on a ¾-mile hike. Anglers can also try shore fishing or use waders. Anglers may only use artificial lures on Lake of the Clouds. Great walleye fishing can be found at the Victoria reservoir, a public-access waterway created by Victoria Dam near Rockland. Located on the west branch of the Ontonagon River, the Victoria reservoir is home to not only walleye (which are regularly stocked) but also bluegill, largemouth bass and black crappie. The recently improved facilities include parking for cars and trucks and an expanded boat launch. Note: the west branch of the Ontonagon River from the confluence with the Victoria Hydro Station upstream to the dam is closed for fishing from April 1 to June 10 annually to protect concentrations of spawning fish. The Porcupine Mountains watershed is home to some amazing brook trout habitat. 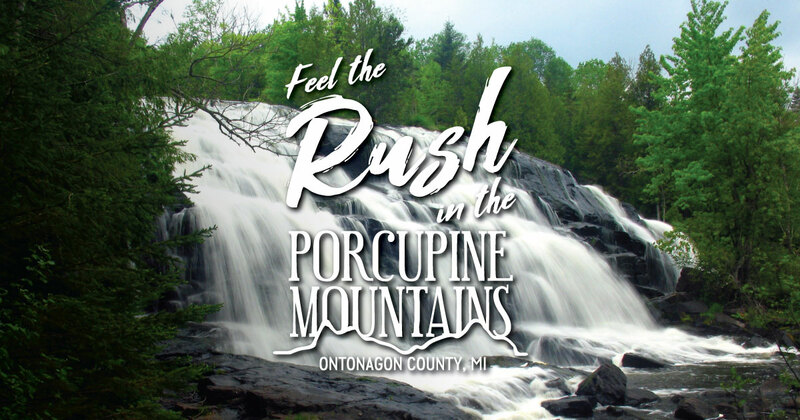 Anglers should explore the Presque Isle River in the Porcupine Mountains Wilderness State Park as well as the nearby Ontonagon River, where they can also find outstanding walleye fishing. Scott’s Superior Inn offers guided fishing opportunities on the Ontonagon River (reservation only). The Ontonagon River is home to walleye, smallmouth bass, and northern pike, as well as rainbow and brown trout in the spring and fall. Stop by Agate Falls, which is a good area for rainbow trout fishing. Some good fishing can be found at the Ontonagon pier (where it meets Lake Superior) and the Ontonagon Marina. The river is also easily accessible at Highway 45, Ewen and Bond Falls. Anglers looking to take in the spectacular sights of Bond Falls can also try their luck on the Bond Falls Flowage, home to walleye, northern pike and smallmouth bass, as well as perch and crappie. Want to know what to pack and where to go? Check out our fun fishing infographic on How to Fish the Porkies.